With a 35,000 primary care physician shortage coming up in 2025, eventually the healthcare policy agenda is going to shift back to the medical education pipeline. In my previous piece on the Iranian healthcare system, I predicted that community health workers were a political dead-end because of the labor market lockout that the AMA has on the healthcare industry. I still predict that’s going to be true, which means that the conversation is instead going to focus on training physicians more efficiently. Fortunately, there’s already work being done on this front. NYU SoM’s annual report highlights (NYU Three Year Pathway) the three-year medical program that the school launched in 2013. Back then the primary goal of the compressed schedule was to lower the overall cost of medical education and differentiate NYU SoM from the rest of the competition in the medical school marketplace, but the efficiency gains due to reduction in training must not be ignored. The first batch of students in the compressed program are now graduating, with 15 out of 16 in the inaugural class successfully completing the degree. In addition, testing of the students shows the three year students demonstrating better knowledge and clinical skills than four year students at the end of their respective programs. This finding has enormous potential ramifications and requires additional research. Was the first three year class special, with top performing students self-selecting into the more ambitious program? I’d like to see a comparison of the three year program graduates against other program applicants who were rejected from the three year program due to space limitations and enrolled into the four year program instead. In addition, the three year students may be performing better because they’ve simply had one year less to forget everything that they crammed in MS1; it would be interesting to compare the clinical skills and knowledge of the three year graduates against their four year conterfactuals after they’ve been practicing medicine for a decade to determine which method is really better at integrating the knowledge for long term use. In the meantime, however, the three year program appears to be winning. What’s important about the accelerated program is that it’s still not fully optimized. The majority of the program time savings is done through cutting down on the time dedicated to electives and residency interview. This is possible because the three year applicants are admitted with a guaranteed residency slot. However, the students in the three year program retain the option of switching back into the four year program,m which means that the core curriculum is still over-training physician to be able to go to any residency. The core curriculum can therefore be collapsed even further to focus only topics and rotations relevant to primary care. I would be shocked if such a degree can’t be reduced to a two year program. Could we produce a family physician in one year? Probably not. But a two year program would be a 100% efficiency gain. Not to mention that being able to filter out primary care physicians out of the same pipeline that needs to train academic researchers and neurosurgeons would allow institutions to price the degree more appropriately, therefore further reducing the cost barrier of entry. The specialization could also allow institutions to relax their requirements for acceptance. Could we then get away with accepting people with high school degrees into this specialized primary care program, therefore collapsing the current 8 year primary care physician pipeline into a 2 year one? I don’t see why not. There’s no reason to require a Bachelor’s degree; practicing clinicians don’t use what they learn for their premed coursework and MCAT. Students in Europe start medical school straight out of high school and our kids aren’t any dumber. The efficiency gains are enormous, but we’ll need to do the work to achieve them. I’ve been holding back from writing about the AHCA, because I wanted to let the dust settle from the fallout of this bill. I say fallout because right from the start it was obvious that the bill was dead on arrival. It just didn’t do anything. It ended the individual mandate, and replaced it with a slightly worse mandate. It ended tax credits, and replaced them with slightly different tax credits. It ended risk adjustment transfers, and implemented a risk adjustment fund. It ended the poor Medicaid funding structure, and replaced it with a slightly better structure that made everybody anxious. If it wasn’t for the estimated $337 billion in savings over ten years, which made everybody really anxious, the only way to make sense of the bill was that it was intelligently designed to be just innocuous enough to pass popular muster, but just incompetent enough to make the core components of the Affordable Care Act to slowly death spiral out of existence. Back in November, immediately after the election, a mild hysteria spread throughout the health policy and administration community. President Trump ran and won on a platform that emphasized the repeal and replacement of the Affordable Care Act, and many vulnerable populations that non-profits work with would have been adversely affected by such a bill. I calmly told my fellow students that there’s nothing to worry about, because safety net benefits are virtually impossible to repeal once they have been implemented. How come? Because it is much easier to demonstrate the specific individual cases that would be adversely affected by the repeal of such programs than to show the widespread, but individually marginal, improvements that a large amount of people would benefit from. And this is exactly what happened to the AHCA. First the Republicans were pilloried in the town halls, which made them hesitate. And then the CBO report came out, the conclusions of which made moderate Republicans completely drop support for the bill. CBO and JCT estimate that, in 2018, 14 million more people would be uninsured under the legislation than under current law… In 2026, an estimated 52 million people would be uninsured, compared with 28 million who would lack insurance that year under current law. So the AHCA died. Which means that we’re in a lot of trouble. A few week after the AHCA report, the CBO issued another report that didn’t get nearly as much coverage despite being arguable the more important one, the 2017 Long Term Budget Outlook. The media didn’t report on it, because the outlook is terrible. 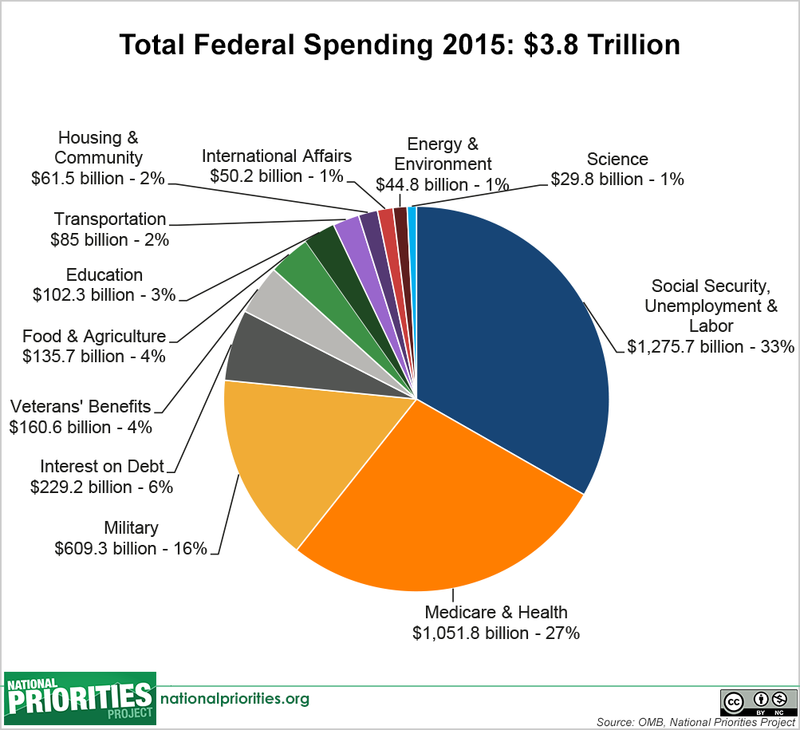 In fact, it’s so bad, that by 2038 virtually all of our tax revenue is going to be consumed by social security and healthcare expenditures (85%), which means that everything else will have to be funded by debt. We’ll have to bring back the “Army of One” recruitment slogan because the DoD will literally only be able to afford one guy on payroll whose responsibility will be to sweep the Pentagon and keep it clean for tourists. Healthcare and social security, by the way, are driving this persistent deficit, which is why they keep increasing as a percentage of the budget. So how much course correction do we need to make to get ourselves out of this hole? We’re expected to cut spending by $380 billion per year just to stop the debt load from growing?? Not only the Republicans were incapable of agreeing on the $337 billion over 10 years draft of the AHCA, they couldn’t even vote on the watered down manager’s amendment version that only saved $150 billion over ten years. If the Republicans can’t even pass this legislation, where in the budget are we supposed to find $380 billion per year? It’s certainly not going to be in the military, which at 16% of the federal budget is dwarfed by the 64% dedicated to benefits. The political reality is that we’re simply not going to find these spending cuts. The US is going to keep using debt to fund benefits, which will need to be paid for by future generations of Americans. The political establishment in Washington is now committed to walking millennials off a fiscal cliff. And so, we’re in trouble. So what happens next? Is there any hope? Entitlements clearly need to be cut and reformed, so how do we get there? In public policy there is a concept that draws heavily on biological sciences called punctuated equilibrium. The theory is that policy, which is a fixed legal construct, generally remains stable and unchanged for long periods of time. However, the world continues to change, which creates misalignment between the policy and reality. This misalignment creates errors, which don’t immediately cause a change in policy because of friction, but continuously accumulate. Eventually the accumulation of errors becomes unbearable and it overcomes the friction therefore punctuating the equilibrium and forcing a period of rapid policy reform that corrects the errors and settles into a new equilibrium. One example is how the decades of inactivity in federal healthcare reform were punctuated by the stars aligning in 2010 and Democrats being able to pass the Affordable Care Act without concern of a Republican filibuster. Unfortunately, the next punctuation is unlikely to happen until 2028, when the Medicare trust fund is scheduled to run out of money. At that point Medicare will need to rely entirely on current payroll tax revenue to make payments, which would require at least 13% in spending cuts increasing to 21% cuts in the subsequent decades. This is painful reality that should create sufficient public uproar to force serious reform from Washington. Maybe. Until then, however, healthcare reform just might be dead on arrival.